Butler High School senior Long Fa Lin (center) was honored by the Southwest District Athletic Board with a Dale E. Creamer Honorary Scholarship. He is pictured with Butler Athletic Director Jordan Shumaker (left) and Principal Thomas Luebbe. 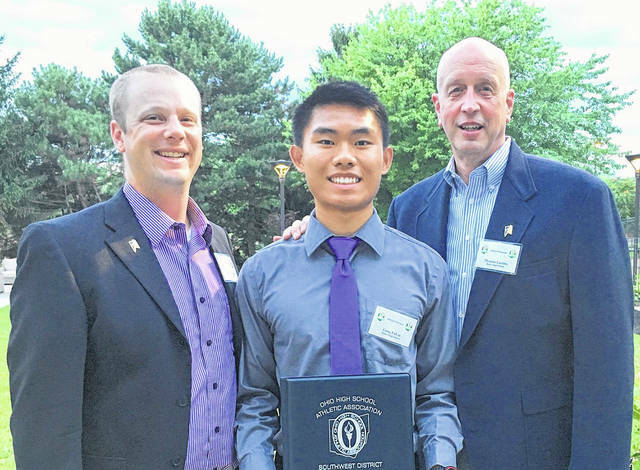 DAYTON — Butler High School senior Long Fa Lin was honored by the Southwest District Athletic Board with a Dale E. Creamer Honorary Scholarship. The award was presented at the District’s 25th Annual Scholar-Athlete Reception on Tuesday, June 19 at the Dayton Marriott. The award is named after Creamer, a principal at Brookville High School from 1982-2004. Creamer served the Southwest District in many capacities until his retirement in 2004. Lin, the son of Feng Zhao and Fang Lin was a two-time state qualifier in Cross Country and a four year All-GWOC runner in track and field. He earned a 3.9 grade point average despite not learning English until he began as a kindergarten student in the Vandalia-Butler schools. Long used that same work ethic when he began running cross country and track as a freshman at Butler High School. Butler Athletic Director Jordan Shumaker noted that it isn’t uncommon to see Lin running very early in the morning or late in the evening. Lin plans to attend Ohio State University where he will study pre-med.